Cheshire is normally viewed as a green, flat county with plenty of cows, some nice towns and a few rich people (and footballers) clustered around Prestbury and Alderley Edge. However, Cheshire has a long industrial history with Stockport in the north (now part of Greater Manchester), Macclesfield in the east, Crewe, Northwich, Chester in the west, Runcorn and Warrington. To support these towns, there were extractive industries in the county and indeed the chemical industry of the Mersey estuary would not have developed had it not been for salt. This page summarises the underground extractive industries in Cheshire of which Alderley Edge formed just one part. Sutton, fireclay Adlington, gritstone Any other? As far as some DCC members are concerned, there is only one mining site in Cheshire, which is Alderley Edge. However, this is far from the case and this page attempts to set the record straight. However, if your interest is solely in Alderley Edge, read no further but follow this LINK to the main Alderley pages. Alderley Edge was a source of copper and lead, the copper going to metal production and into copper sulphate fungicide while the lead was used to make lead paint. Cobalt, used to make blue paper and glass, was also extracted at Alderley Edge for a short time at the start of the 19th century but attempts to sell it later in the 19th century were unsuccessful. The Peckforton hills have been mined for copper for centuries. The earliest reference to Peckforton and Bickerton is in the letter written by the German J D Brandshagen in 1697. As with Alderley Edge, work appears to have continued intermittently until the 1860s and very limited work seems to have been done in the 20th century. The mines range along a north-south fault parallel with and on the east side of the mid-Cheshire ridge. British Mining No 16 carries an informative article about the mines written by Chris Carlon. 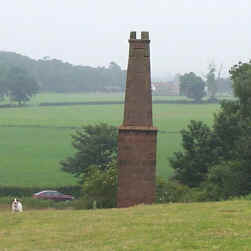 The picture to the left shows the familiar stone chimney adjacent to the Engine Shaft near Copper Mines Lane. Don't be misled by the name of the pub about 2 or 3 miles away at Broxton, that Copper Mine has pictures of south-western mines in the bars. Copper is not the only substance mined at Peckforton. 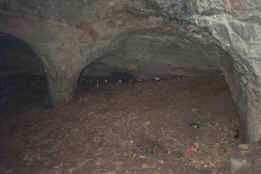 On and around the hills, there are several holes, some with curious names such as Mad Allen's Cave, which were probably excavated for the sand. The caves below the castle were likely to have been for this purpose too. The sand from these mines was used in cottages as flooring which was clean and could easily be swept out. The easiest mines to find are at Raw Head, just below the trig point on the top of Peckforton hill itself. The picture to the right was taken at Raw Head. Salt has been extracted from Brine in Cheshire since pre-historic times and Roman remains of salt works are found in Northwich, Middlewich and Nantwich. Mining started after a chance finding of salt beds at Marston in 1670. The miners were looking for coal but found salt instead. Mining took off seriously in the 18th century and has continued ever since. The Meadowbank mine at Winsford is still working producing rock salt for roads and to be processed. 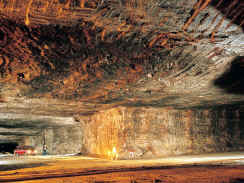 The picture shows the massive galleries now mined using heavy motorised plant. Coal has been mined at several sites around Cheshire where the coal measures of the carboniferous rocks outcrop. Typical sites are at Mow Cop, Macclesfield, Pott Shrigley, Poynton and Romiley near Stockport. There is no doubt that Macclesfield coal would have found its way to Roe's smelter and possibly to Alderley Edge itself during the 19th century. The picture to the right is of Park Pits at Poynton (from © David Kitching collection with thanks). See David's website at www.brocross.com/poynton/intro.htm. Coal is also found to the west of the county around Wrexham but this is outside Cheshire so does not count on this page. Although coal is "mined", the differences between the skills required for coal and for metal mining are so great that it is not surprising that no coal miners are named at Alderley Edge in the 19th century. Most of the miners at Alderley at that time came from the hard rock regions: Durham, Yorkshire, Derbyshire, Devon and Cornwall. Ganister, a form of silica, was mined at Astbury and at the north end of the ridge that forms Mow Cop. Ganister is a hard, fine-grained quartzose sandstone used in the manufacture of silica brick typically used to line furnaces. Ganisters are cemented with secondary silica and typically have a characteristic splintery fracture (ref: Wikipedia). The ganister was quarried at the outcrop and then followed underground at the mines at Mow Cop. In 1908, the Astbury Silica Co. Ltd. had 11 people working underground. It was also mined at Sutton, near Macclesfield where there were various small workings. There were mines at Mow Cop for limestone and recent exploration work has revealed some of the entrances. The limestone at Mow Cop appears to underlie the coal deposits and was worked from quarries and shafts. Not much appears to be published about the limestone workings but 12 people were working below ground in 1908 at the Astbury Hydraulic Lime & Stone Co. Ltd., Congleton. There is more information about limestone at Mow Cop at the website: www.mowcop.info/htm/industry/limeworks.htm. That website also has a copy of the 1808 map of the area and shows the ganister works. Limestone was processed at lime works at Marple but two shafts shown adjacent to the canal near Chapel House and Churchgate Lodge on the 1909 OS map are coal mine shafts, not limestone mining. 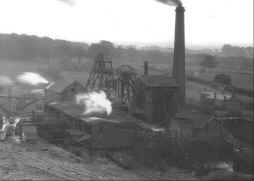 Fireclay was mined at Bollington and Pott Shrigley. Fireclays are mudstones found below most coal seams. They are the fossil soils under the coal-forming vegetation. They are rarely found other than in coal-bearing strata. The term ‘fireclay’ is because of their ability to resist heat and their use in making refractories for lining furnaces. Today the term ‘fireclay’ is more widely used. More information about fireclays can be found at www.bgs.ac.uk/downloads/start.cfm?id=1356 on the British Geological Survey website. I am told that gritstone was briefly and possibly illegally mined in the Adlington area. At Styperson, there was a stone works processing stone from nearby quarries and there was also coalmining taking place. It is quite possible that stone would be removed from the mines as well. Some information about Styperson can be found at www.pittdixon.go-plus.net/adlington-styperson/adlington-styperson.htm. I am grateful to David Kitching for prompting me to add the entries on fireclay and gritstone and to Ian Norris regarding Neston. Does anyone know of any other mines in Cheshire? If so, please let the webmaster know.